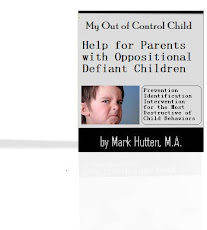 Effectively teaching kids with Oppositional Defiant Disorder [ODD] can be a very exhausting endeavor – if you don’t know how, that is. And then comes the most important part... you must be consistent in enforcing them all the time, with every child, using predictable and delineated consequences. Some educators suggest writing the class rules with your ODD children, using their input to create "buy-in" and cooperation. Consider the benefits, though, of strong, educator-determined rules that are not viewed as negotiable by the people who must follow them. Weigh the pros and cons before deciding which method to employ. State your rules in the positive (no "don'ts") and expect the best from your ODD children. They will rise to the high expectations you set starting from the first minute of the first day of the school year. 4. Have a winning attitude. 5. Have fun and learn! Some educators like to be more specific in their rules, such as "Hands must be kept to yourself at all times." The most important thing is to spend time before the school year starts determining which rules fit your voice, personality, and objectives. Your most difficult students require creative discipline solutions. You know the kids I'm talking about. Every educator has at least one difficult child in her class, a youngster who needs extra structure and incentive to change bad behavior habits. These aren't bad kids, just kids who need a little extra support, structure, and discipline. Behavior contracts can help you mold the behavior of these ODD children so that they no longer disrupt learning in your classroom. Thus, you can, slowly but surely, take control and see concrete improvement fast. A behavior contract is an agreement between the educator, child, and the child's parents that sets limits for child behavior, rewards good choices, and outlines consequences for bad choices. This type of program sends a clear message to the youngster that "This behavior cannot continue. Here is what we need to see from you and here is what you will see in response to your choices in the classroom." First, make a plan for change. Use the Behavior Contract form below as a guide for the meeting you will soon have with the child and his/her parents. Tailor the form to your particular situation, taking into consideration the personality and preferences of the youngster you are helping. Next, hold a meeting with the involved parties. Perhaps your school has an assistant principal in charge of discipline; if so, invite this person, too. The child and his/her parents should attend as well. Focus on 1-2 particular behaviors that you would like to see change. Don't try to change everything at once. Take baby steps toward major improvement so that it feels more "do-able" to the youngster. Also, the moms and dads will feel less defensive towards you if you make it seem like there's only a little "fine-tuning" to be done. Make it clear that you called this meeting because you care about this youngster and want to see him/her improve in school this year. Emphasize that the parent, child, and educator are all part of the same team. Convey that "I can't do it without you. We're all in this together." Define the tracking method to be used on a daily basis for monitoring child behavior. Describe the rewards and consequences that correlate with behavior choices. Be very specific and clear in this area. Use quantitative numbers wherever possible. Involve the moms and dads in providing the rewards and consequences, taking much of the pressure of enforcement out of your hands. Constant school-to-home communication will go a long way towards significant progress with this youngster. Make sure that the chosen consequences are truly important to this particular youngster; you can even ask the youngster for input which will make him/her buy into the process even further. Have all involved parties sign the agreement and end the meeting on a positive note. Schedule a follow-up meeting to discuss progress and make adjustments to the plan as needed. The follow-up meeting should be in 2-6 weeks, depending upon your assessment of the situation. Let the youngster know that the group will be meeting again soon to discuss progress. In the meantime, be very consistent with this youngster in the classroom. Stick to the wording of the behavior contract agreement to a "t." When the youngster makes good behavior choices – heap sincere praise upon him/her. When the youngster makes not so good choices, do not be apologetic; if needed, pull out the contract and review the terms that were agreed upon. Emphasize the positives that come along with good behavior choices and help the youngster to get used to new habits of good behavior. Most of all, be patient. Do not give up on this youngster. While you may feel like pulling your hair out right now, as you see the youngster grow and develop, you may find this relationship to be one of the most rewarding of your teaching career. Such kids often need extra love and positive attention, so don't let your frustrations get the best of you. You might be surprised at the huge feeling of relief that all involved parties feel just by having an agreed-upon plan. Now that you all know how to proceed, a happy ending is in sight. Use your educator's intuition to start yourself on a more peaceful and productive path with this youngster. [Student name] is expected to follow the educator's directions the first time she asks him to do something. He/she is expected to do so promptly and with a good attitude. Each time that [Student name] does not meet these expectations, he/she will receive a tally mark for the day on the tracking sheet. These tally marks will determine the rewards and consequences that [Student name] receives, as shown below.